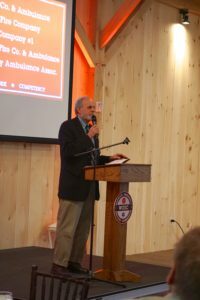 GKH founding partner John Gibbel served as emcee at the May 4 Warwick Emergency Services Commission (WESC) volunteer appreciation banquet. This first-ever gathering of all the organizations within WESC recognized the combined 3,000-plus years of volunteer service by the Brickerville Fire Company and Ambulance, Brunnerville Fire Company, Lititz Fire Company #1, Rothsville Volunteer Fire Company and Ambulance, and Warwick Community Ambulance Association, along with municipal partners Elizabeth Township, Lititz Borough and Warwick Township. In addition to his emcee responsibilities, John shared his personal experience as a grateful recipient of some of those volunteer services. Eight years ago, members of the Rothsville Volunteer Fire Company performed CPR on John, saving his life when he suffered a heart attack. To read the story, click here.